Daily use of your gate over the years can take its toll on the various parts of the system. The best way to combat this issue is by having maintenance performed on it every now and then to catch problems in the early stages and prevent them from becoming serious issues! Even if you're not sure what the problem might be, we offer troubleshooting to get to the bottom of any potential trouble and ensure it's taken care of before you know it. Safety tests are a great way to ease your mind knowing that your gate is absolutely safe to be around, particularly if you have kids or pets. We'll take care of replacing parts if need be, including the very vital sensors, should repairs not be enough to solve the issue. The opener is another very important component to your gate's overall system, and if it's having trouble it can put a strain on everything and cause even more damage. That's why it's important to get any problems taken care of as soon as possible, which is where we come in! We can repair whatever's causing it to slow down, get stuck, or otherwise. This includes repairing photo-eye sensors or replacing the sensors if they're too far gone to fix. It's important that everything is able to move smoothly where you work, and this includes employees being able to get in and out quickly and easily! If the gate at your company is starting to impact this by getting stuck or moving slowly, it's time to call the professionals. We can repair the opener, or the hinge wielding if it has weakened and rusted over the years. It may simply be a case of the gate being misaligned and causing it to not close correctly, at which point we'll get it back on track. Our professionals can take care of automatic gates as well! 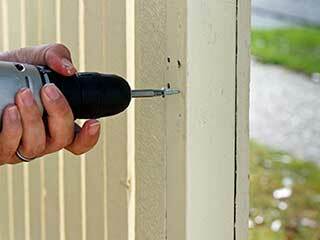 Contact Garage Door Repair Dallas today and let us give your gate a helping hand!